Longtime attendees and first-time performers Little Junior knew what they were getting themselves into with their Hillside set. 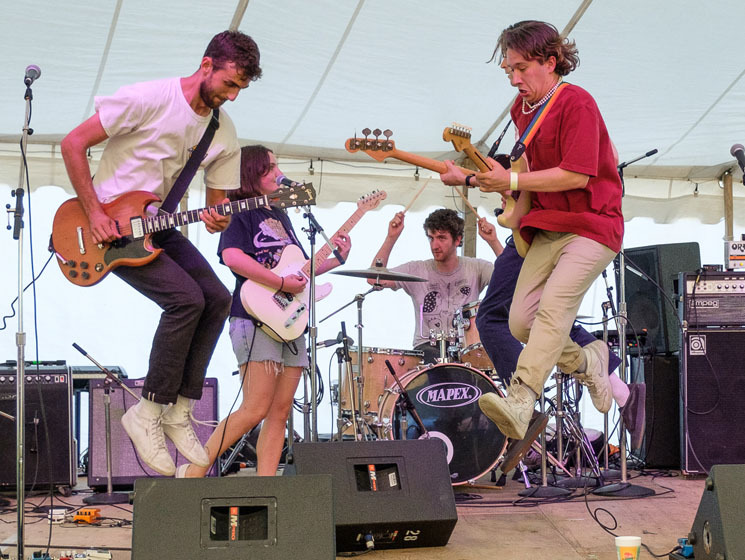 Delivering air-tight renditions of tunes from their newly released debut, Hi, the band showcased their penchant for catchy riffs, vocal hooks and '90s alt-rock. The band were practically daring anyone to challenge them: lead singer Rane Elliott-Armstrong declared no fewer than three times that "this song's for the haters," and a purported cover of a track by a "famous Canadian punk rock singer" turned out to be Carly Rae Jepsen's "I Really Like You." But all it showcased was how dang likeable the band really are: Their garage rock take on the pop singer's smash hit added some welcome grit to the clean source material, and tracks like "Pump," about "gay blood and how you're not allowed to donate it" added a welcome sense of vitality and perspective. Old school Weezer and Green Day were the sonic touchstones of choice — guest guitarist Zoe G (of Elliott-Armstrong's other band, Bueller) was wearing a Dookie shirt, further inviting comparisons — and with G's mid-set addition to the band, which raised the number of guitarists to three, the band's endless stream of alt-rock riffs hit even harder. Closing number "Cry Baby" declared "I want to destroy my reputation," but they're doing a bad job with their tight, hooky tunes and charming disposition.